Interaction overview diagram is a kind of UML diagram. It is the variant of UML activity diagram that shows specifically the flow of interaction diagrams like sequence diagrams. Perform the steps below to create an UML interaction overview diagram in Visual Paradigm. In the New Diagram window, select Interaction Overview Diagram. Initial node is the beginning of a control flow. To create initial node in interaction overview diagram, click Initial Node on the diagram toolbar and then click on the diagram. An initial node is created. The caption of initial node is hidden by default, to show it, right-click on the diagram and select Presentation Options > Show Shape Caption > Initial Node from the pop-up menu. Move your mouse pointer over the initial node. Release the mouse button at the place where you want the decision node to be created. 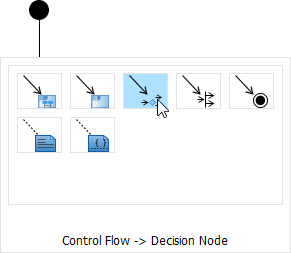 Select Control Flow -> Decision Node from Resource Catalog. 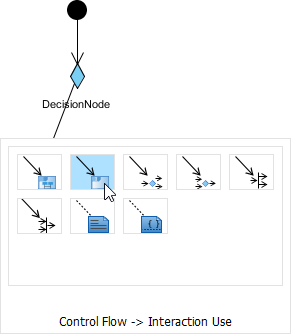 A new decision node will be created and is connected to the initial node. Enter its name and press Enter to confirm editing. Release the mouse button at the place where you want the interaction use to be created. Select Control Flow -> Interaction Use from Resource Catalog. A new interaction use will be created and is connected to the source node. Enter its name and press Enter to confirm editing. You can make the interaction use refers to a diagram by right clicking on it and select Refers to > New Sequence Diagram from the pop-up menu. When sequence diagram is created, rename the diagram. When you return to the interaction overview diagram, you can see the interaction use caption shows the diagram it refers to.